I love the soft muted background and then all the details that come through in the first flower. So beautiful – and thank you – I am feeling pretty color deprived while surrounded by snow with more on the way! The colors in your photograph are as vibrant as a Caribbean Island. Happy weekend to you, too! Beautiful, so soft and delicate. Have a great weekend, too! Ah, that’s how you make it through winter. At this point, we need a lot of imagination! Love the quote and the photo. These colors are pure springtime loveliness!! So pretty to see in February! I wasn’t able to sleep so decided to check my Reader. These are so soft and lovely – I believe I will be able to doze off with them in my mind. Thanks, and I wish you a good week-end for some more photography. I love the colour of that bottle holding the delicate pastels of those flowers! We are so lucky to be able to bring a touch of spring inside during these first two months of the year! Your image is both soft and colorful… and much enjoyed this. winter morning. Happy Weekend to you, too, Susan! This is lovely. 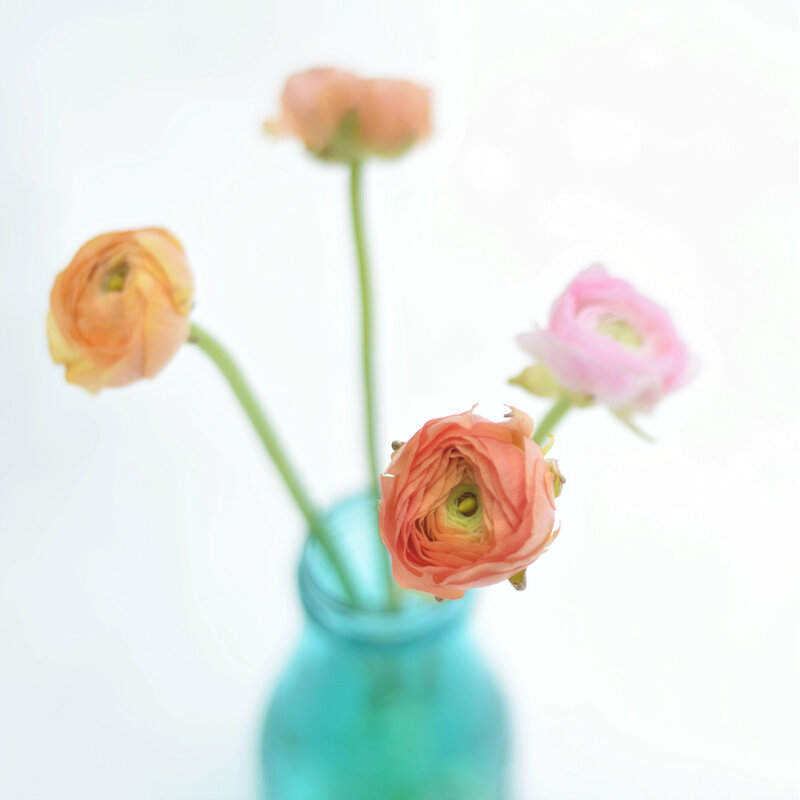 I love ranunculus, they are just a gorgeous flower. Lovely capture, beautiful flowers and wonderful quote. Great post! This is absolutely stunning Susan! SO nicely done. Great quote. Thank you. The MOST delicious colors! The vase really pulls it all together. Love the softness! I love this image. The colors the movement the feeling. Just lovely!